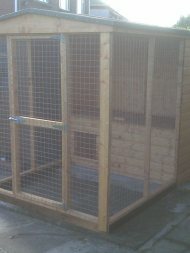 We manufacture, delivery and install premium quality dog kennel throughout Northern Ireland. We provide an incredible choice of sizes from small kennels for Pekingese, Chihuahua and Pomeranian right up to huge kennels for large breeds like Great Dane and Wolf Hound. All our dog kennels are constructed with tongue and groove sheeting which will keep the unit water tight in the most extreme conditions. 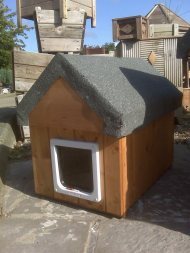 They are treated with preservative and roof covered with mineral felt. All come with a door either on hinges or sliding, they all have the option for full insulation and lining and a plastic flap door. Roofs can be pitched or pent and can be removed for cleaning.